Meratian, M., Hadjari, A. (2008). Physical Modeling of Steel Delivery during Thin Slab Continuous Casting. International Journal of Iron & Steel Society of Iran, 5(1), 41-46. M. Meratian; A. Hadjari. "Physical Modeling of Steel Delivery during Thin Slab Continuous Casting". 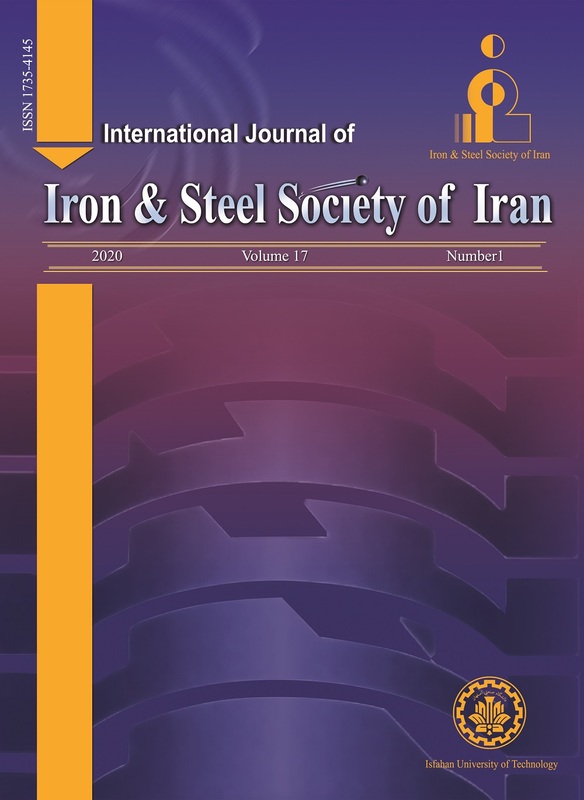 International Journal of Iron & Steel Society of Iran, 5, 1, 2008, 41-46. Meratian, M., Hadjari, A. (2008). 'Physical Modeling of Steel Delivery during Thin Slab Continuous Casting', International Journal of Iron & Steel Society of Iran, 5(1), pp. 41-46. Meratian, M., Hadjari, A. Physical Modeling of Steel Delivery during Thin Slab Continuous Casting. International Journal of Iron & Steel Society of Iran, 2008; 5(1): 41-46. A full scale physical model of a thin slab caster with a four-hole design submerged entry nozzle (SEN) was constructed. On the basis of the dimensionless Reynolds and Froude similitude criteria, the fluid flow in a full-scale model is similar to that of the actual system and, hence, the data obtained from the water model can be applied to the actual system. In order to determine the optimum operational parameters, experiments were carried out under different casting conditions. The results showed that the four-hole nozzle design leads to a special flow pattern. It was also shown that increased casting speed and gas injection both resulted in surface turbulence. In order to avoid surface turbulence and the related casting problems, it is recommended that SEN depths of 30 and 40 cm be used for casting speeds of 3.5 and 4.5 m/min, respectively. Y. U. Sok, I.V. Samaresekera, B. G. Thomas, Metal. and Mater. Trans. B, 33(2002), 437. S. H. Seyedein, Hassan M., Int. J. of Heat and Mass Transfer, 40(1997) 4405. N. J. lawson, M. R. Davidson, J. Fluids Eng., 124(2002), 543. B. G. Thomas, X.huang, 76th ISS conference,Dallas,Texas, (1993), 34. J. Szekely, J. W. Evans and J. K. Brimacombe, The mathematical and physical modeling of primary metals processing operations, John Wiley and Sons, (1988), 145. R. E. Johnstone, M. W. Thring, Pilot plans, models and scale –up methods in chemical engineering", McGraw Hill, (1957), 176. J. Parker, J. Boggs, E. Blicks, Introduction to the theory of similarity, Academic press (1965), 55. J. Szekely, Fluid flow phenomenon in metals processing, Academic press, (1969), 243. F. Kemeny, D. J. Harris, A. McLean, T. R. Meadowcroft, J. D. Young, 2nd process technology conference, 2(1990), 232. W. J. Donaldson, Canadian Metallurgical Quarterly, 7(1968), 235. B. G. Thomas, L. J. Mika, F. M. Najjar, Metall. Trans. B, 21(1990), 387. T. Honeyands, J. Lucas, J. Cahmbers, J. Herbertson, Steelmaking Conference Proceedings, (1992) ,451. R. M. McDavid, B. G. Thomas, Metall. and Mater. Trans. B, 27(1996), 672. B. Nagayasu, Y. Ryoji, Y. Hisao, F. Tetsuya, N. Tsutomu, T. Seiji, ISIJ Int., 31(1991), 40. G. Abbel, W. Amen, G. de Gendt, W. Tiekink, ISIJ Int., 36(1996), 219.